Honoring Veterans Day, Mayor Eric Jackson of Trenton accepted Michelle Obama’s Challenge to End Veteran Homelessness in 2015 and announced that Trenton/Mercer will achieve this goal. Mayor Jackson declared “our commitment to veterans needs to be more than a one day event. This is a moral imperative. 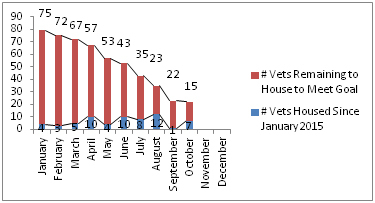 Veterans have served us and it is only right that we provide them with permanent housing; a place to call home”. He praised the partnership with Mercer County Executive Brian Hughes who said “We don’t want to manage homelessness, but end it”. 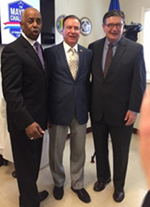 An event held at the CEAS Center, the new City of Trenton funded one stop center for single homeless individuals was an opportunity for Mayor Jackson to thank all the community partners and veterans organizations for this coordinated effort. The Mercer Alliance to End Homelessness developed the Plan and strategy to house veterans. Frank Cirillo, Mercer Alliance Executive Director discussed the importance of an alliance and the need for everyone to be laser focused on the same goal. 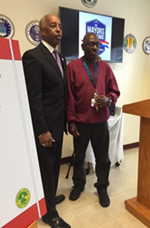 "Through our collective efforts, we were able to identify 79 homeless veterans in our community. We have made a commitment to house all 79, no matter how great the challenges they face. They have served us, and we are now honored to serve them. That is exactly what the Alliance's plan to end veteran homelessness is intended to do. It is a commitment we make today, and a pledge we make for the future."